Steampunk isn’t just about airships, and tinkering. No, it’s about way more than that. It’s about 1800s manners. And knowing when to be a little more modern in your thinking. Steampunk is about a look, and a feel. It’s about all the things that make the 1800s interesting…and airships. You have to walk the walk of a true Victorian gentleman. When addressing a lady you must call her “Madam”, or “Miss”—depending on which is appropriate. You must also know how to fix all sorts of infernal devices, and be familiar with all sorts of unseemly sciences. Fear can’t get in your way when you climb on board a cobbled together airship (this is when those tinkering skills come in handy). You must also look the part. In this Men’s Steampunk Jack Costume everyone will know you are a gentleman of the first class. And that you won’t take no gruff from anybody! A man does have to assert his abilities sometimes. 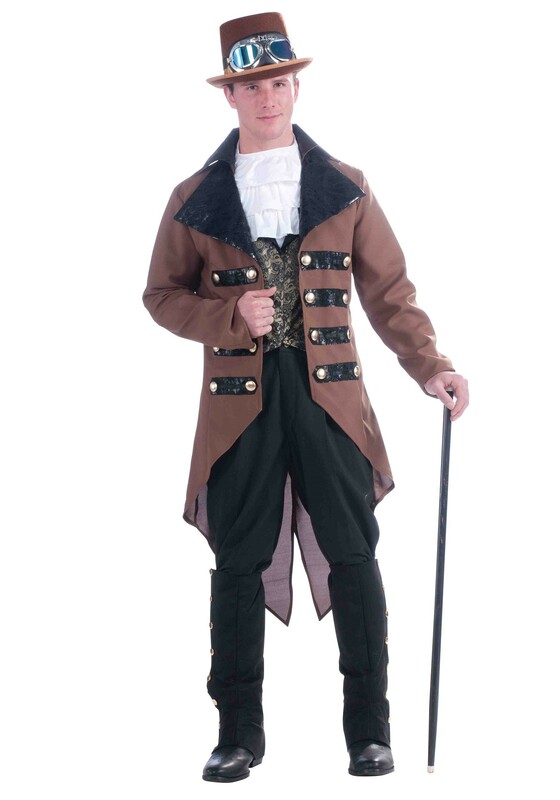 The brown jacket will give you the look of the 1800s, and the brass-gold buttons will give the steampunk feel. Just don’t forget to grab some cyber-steampunk goggles on your way to the check out. You don’t want to subject your precious peepers to any harsh light when you are fixing that cobbled together airship you found yourself on!